When Imperial Recruiter comes into play, search your library for a creature card with power no greater than 2, reveal that card, and put it into your hand. Shuffle your library afterward. 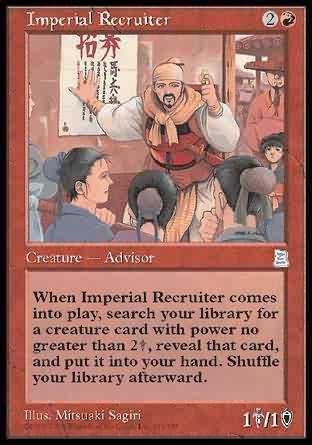 When Imperial Recruiter comes into play, search your library for a creature card with power 2 or less, reveal that card, and put it into your hand. Then shuffle your library.